A Ramsgate thug who hit a man in the face with a glass with such force that the victim was left with life-changing injuries has been jailed. Daniel Purvis, 38, of South Eastern Road, denied wounding with intent following the incident. 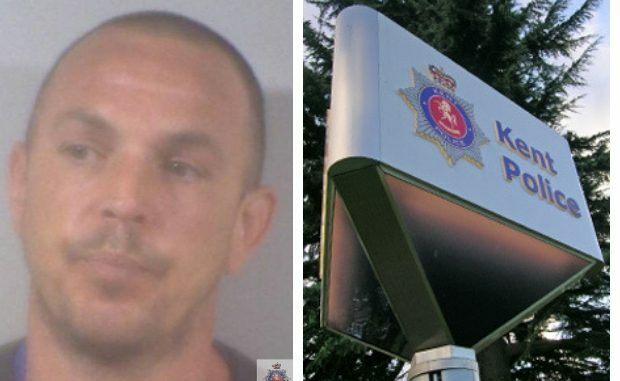 But he was convicted of the offence following a trial at Canterbury Crown Court and on Friday (January 25) he was sentenced to nine years in prison. Purvis launched the attack at a pub in Harbour Parade, Ramsgate, in the early hours of Sunday 20 May 2018. The victim, a 26-year-old man, was in the pub with friends when Purvis became aggressive to one of his friends on the dance floor. Fearing his friends were about to be assaulted by Purvis, the victim stepped between them. But Purvis struck him in the face with a glass which then shattered, causing the victim’s cheek to bleed heavily. Purvis admitted being in the pub and being involved in an altercation but he claimed he had felt threatened by the group and had barged past them with his hands spread in front of him. He denied he was carrying a glass at the time. His account was called into question by CCTV footage inside the pub, which showed a hint of a glass in his hand before he struck the victim. Purvis was then seen leaving the pub with a red mark on his hand. Investigating officer PC Hisham Hijazi said: “As a result of the assault the victim has been left with life-changing injuries. His wounds needed more than 40 stitches and he will be permanently scarred. “This was a vicious and unprovoked attack on a man who was enjoying a night out with his friends. By jailing Purvis for nine years, plus a three year extension to his licence, the Judge has shown just how seriously the justice system views violent crime. Plenty of mindless thugs in Thanet hostelries. Let’s hope the authorities can bring a few more of them to court and let’s hope the courts will continue doling out long sentences. These people have no place in a civilised society.